Nectar Group provides innovative and cost-effective solutions for handling bulk commodities worldwide, and has pioneered mobile, high speed bagging systems for use in ports. From the development of its mobile bagging machines called Compac series, which can bag free-flowing cargo at a rate of 140tph (tonnes per hour), to projects involving lightening and discharging vessels in port, to providing a complete consultation process with clients to build the most efficient cargo handling facilities, Nectar Group has the experience to assist in all aspects of bulk handling throughout the world. The flexibility of Compac mobile bagging equipment allows bagging operations to be carried out not only at the quayside but also in closed spaces with limited height such as warehouses or at silos and terminal storage facilities. In addition to Nectar’s bagging equipment, the group also owns and operates a fleet of bulk materials handling equipment such as grabs and pneumatic dischargers (vacuvators). This equipment can be used for bulk discharge and lightening operations. The vacuvators have the capacity to discharge cargo at speeds of up to 100tph (per unit). Several units can be combined to reach a discharge speed of 7,000 metric tonnes to 10,000 metric tonnes per day. monitoring performance of projects during implementation up to installation and commissioning of equipment. The Nectar Group, which has pioneered mobile, high speed bagging systems for use in ports, has once again gone back to the drawing board to discover what new and innovative equipment could benefit the bulk handling industry. The Group, which operates largely in developing ports, has found a desire to make essential port equipment within the port more flexible and mobile with the use of ISO containers. The company originally designed the first bagging equipment that is wholly contained within just two standard ISO 20ft containers — meaning that the units can be shipped and trucked easily around the world to ports where they are needed for spot cargoes. The concept of full mobility was then stamped onto the other products to come out of the Nectar factory – mobile big bag machines and 10ft mini bagging machines followed suit. The company’s latest development to be introduced into the port sector to mimic the level of mobility is the revolutionary ‘Modular Bulk Hopper’ (UK Patent Application Number 1406035.4) that consists of 2 x 20ft ISO containers and 1 x 40ft ISO container to create a fully functioning Large Bulk Hopper for standard use with most free flowing bulk commodities. The entire assembly can be erected on the quayside in under an hour by Nectar trained personnel and a single forklift truck, reach stacker or container crane can be used to assemble the equipment with relative ease making it suitable for use in most locations where the equipment is required. The advantages of containerizing port equipment may not be immediately obvious. However, Nectar has discovered that by increasing the mobility of bulk handling equipment this increases the number of locations that can benefit from the utilization of the equipment. Bulk hoppers are often seen lingering on quaysides waiting for their next opportunity to be used taking up increasingly valuable space within the port. With containerized hoppers, the equipment can be broken down swiftly and trucked to storage areas outside of the port for convenient storage until they are required again. Alternatively they can be containerized and lifted onto the vessel with standard container lifting equipment or the vessel’s gear and shipped to the next port of call where they can be set up and used in the same way. The multiple conveniences provided by Nectar’s novel Bulk Hopper do not compromise the standards of safety and structural integrity. The hopper frame, made from SS400 Steel, works as a standard Large Bulk Hopper with the integrated valve mechanisms manufactured from high grade stainless steel and Teflon lined blade guides for increased control of discharge. The Hopper allows trucks with a maximum height of four metres to be loaded with cargo that has been discharged into the hoppers directly from the ship’s holds with grabs. There are of course particular ports around the world that will benefit from such developments as the lesser developed ports often lack the investment of infrastructure needed to handle bulk cargoes. By providing this opportunity Nectar is opening up the potential of these ports to easily handle such commodities without the restrictions usually associated with Bulk hoppers. Barrier foils are a flexible barrier with the lowest known water vapour and oxygen transmission rates. Polythene liners let water vapour and aggressive gasses seep through allowing deterioration of product to occur, but this can be eliminated by the use of a barrier foil liner. Barrier foil liners manufactured by Protective Packaging Limited are designed to provide total protection for dried products that have sensitivity to moisture, oxygen and other climatic and biological volatiles, and can also prevent odour transfer either into or out of the product. Combined with a barrier foil liner, FIBCs can be used to pack bulk products which previously had to be shipped in sealed containers such as steel, plastic or fibreboard drums due the FIBCs’ inability to provide complete climatic protection for very hygroscopic and oxygen sensitive materials. Not only does the barrier foil liner with FIBC offer a material cost saving but shipping space efficiency can be improved by up to 40% over drums. All liners are tailor-made to suit the dimensions and style of the FIBC. They can be made open topped with flat base or with filling and/or discharge spouts, thus ensuring safe filling and emptying of the FIBC. These liners can also be fitted with valves that facilitate gas flushing of the liner allowing residual oxygen to be displaced, vacuuming of the liner and taking samples of the residual air in the liners for analysis, all without the need to open up the hermetically sealed liner. Industries include pharmaceuticals, foodstuffs, chemicals and polymers, or any product which may be susceptible to moisture. Starlinger & Co GmbH and SABIC will show an FIBC (Flexible Intermediate Bulk Container) made of PET tape fabric at this year’s Interpack in Düsseldorf, on 8–14 May. Starlinger and SABIC have developed the technology for the production of fabric made of PET tapes. PET tapes stand out for their high tenacity and high creep modulus as well as low thermal shrinkage, providing fabric and articles produced out of it with exceptionally high strength and long-term form stability. A bulk packaging application, where these characteristics are especially important, is FIBCs, also called big bags. FIBCs made of PET tape fabric have superior dimensional stability due to their higher rigidity and higher creep modulus, compared with existing polypropylene FIBCs. They maintain shape and circumference during long storage periods and in hot weather. PET FIBCs can be used for packaging of bulk materials with slippery characteristics — for example, expandable polystyrene beads and polymer chips with slip additives. Such materials cannot be packaged in polypropylene FIBCs as they would be prone to tilting and bulging. Being dimensionally stable, PET tape FIBCs offer a better alternative to more expensive packaging such as cardboard octabins which are used for bulk materials with high flow tendency. PET FIBCs are also easier to fit into sea containers due to better shape retention. SABIC ranks among the world’s top petrochemical companies, and is among the world’s market leaders in the production of polyethylene, polypropylene and other advanced thermoplastics, glycols, methanol and fertilizers. SABIC has significant research resources with 19 dedicated Technology & Innovation facilities around the world. Starlinger & Co. GmbH is a renowned supplier of machinery and process technology for woven plastic packaging production. The product range of Starlinger textile packaging covers all types of machinery for the production of tape fabric for modern woven sacks, geo- and agrotextiles, heavy duty fabrics and FIBCs. Handling bulk cargoes at the quayside of inland destinations is a complex operation. Technical acumen, relevant industry experience and above all the right equipment determine the overall profitability of operation. A cost-effective solution tailored to the efficient discharge and bagging of bulk commodity is a vital ingredient to the success of an operation. Over the last 15 years, Rapidpack CorporationTM has been partnering with leading shipping companies, importers as well as port terminals, providing the world’s most cost-effective and efficient solutions for bulk discharge besides packaging. Rapidpack equipment is engineered in Canada and based on years of practical experience, working in diverse conditions with a variety of cargoes. The company’s Mobile Bulk Bagging Machine is manufactured to be totally self-contained, technically advanced as well as easy to operate with limited training. Housed in two 20ft Lloyds-certified containers, Rapidpack’s bagging system is designed to operate around the clock. “In handling bulk ships regularly, ports see a substantial financial gain in offering bagging services,” says Omran Alikhan, CEO of Rapidpack. “With mobile bagging systems like the Rapidpack system, ports can service bulk ships at numerous berths. Bagging at a speed of up to 140tph (metric tonnes per hour), a single Rapidpack machine can discharge up to 3,300 metric tonnes per 24-hour day — across two bagging lines. With discharge speeds like this, the port can turn around ships faster thus accommodating more ships. 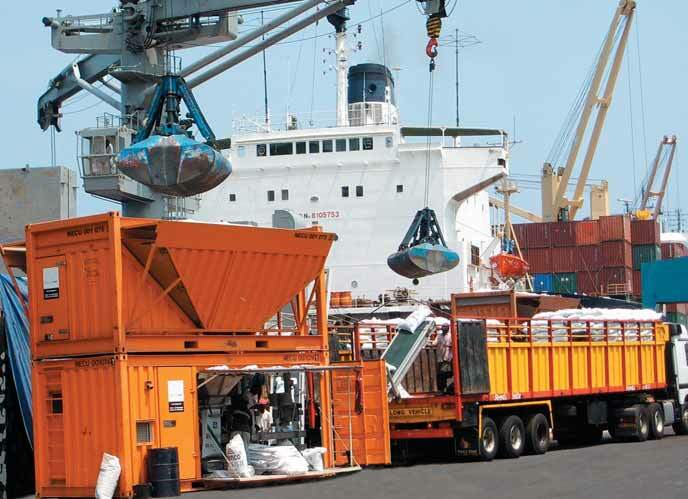 Additionally ports increase revenue streams through offering bagging services to bulk ships charging on a rate per tonne basis.” Each unit contains built-in scales, certified in accordance to international standards enabling us to guarantee accurately weighed bags and detailed records of delivered and received cargo quantities. Because of the equipment’s mobility and versatility, the usage can be customized to meet the different requirements of each client; thus making logistics and transportation most economical. All parts as well as ancillary equipment are solid state and manufactured to the highest standards and supplied by renowned North American, European and Japanese specialist manufacturers. Installed on the shipside, at a rail terminal or in a factory, the Rapidpack machine is fed by ship grab, ship unloaders or a feed pipe from a silo or an inclined belt conveyor. The machinery enables customers to set up and operate a bagging terminal within days; it does not require special foundations or building works. The Rapidpack bagging units can bag up to 140tph, with weight values ranging from 25kg to 100kg. The units are capable of weighing open-mouth bags, valve bags, form/fill/seal packages and IBCs. To ensure complete accuracy in weighing, all units are equipped with gravity-fed automatic net bagging weighers and industrial weighing systems. World renowned and tested scales produce bags with most accurate weight. Rapidpack CorporationTM has also developed a unit capable of filling 1,000kg FIBC bags for grains, pulses, sugar, fertilizer etc. These units are designed for working in harsh climates and conditions. Rapidpack’s contributions have helped shape this technology and positively impacted companies across many industry lines. Rapidpack bagging equipment provide an efficient means to fill and securely close a bag to prevent the contents from leaking or sifting out once it has been filled. The bags are totally sealed on all sides prior to filling except for an open sleeve located in a corner to allow introduction of material that is to be held within. Expert engineers equipped with the latest engineering tools to expedite the work and to limit to the minimum possible errors design all the company’s products. An electronic load-cell technology is utilized to efficiently maintain accurate weighing results. The compact-designed with a minimum space serves to improve packing work and to save labour costs. bulk discharge hoppers (to feed trucks, rails, cars, etc). Rapidpack CorporationTM continues to grow moving into 2015. With its Global Sales Center based in Dubai (UAE), technical consultants/engineers are a short distance from many of the leading ports of the world. When choosing an FIBC supplier, focusing on price alone can be costly — quality and business ethics are equally important factors. The European market for Flexible Intermediate Bulk Containers (FIBCs) is more competitive and globalized than ever, with the majority of FIBCs imports originating from India,Turkey and China. On the one hand, consumers of FIBC are cost conscious with an eye on the bottom line. On the other hand, compromising on safety or ethical principles is no solution. Users who make poorly informed decisions when sourcing FIBCs put their company and personnel at risk — non- conforming FIBCs can pose risks to health, the environment, company reputation and not least, financial risks. To aid FIBC consumers in making well-informed decisions, the European Flexible Intermediate Bulk Container Association (EFIBCA) has started two new initiatives: the EFIBCA-Q Quality Pledge and the EFIBCA Code of Conduct. High standards for quality and safety of FIBCs used in material handling have been a key topic at EFIBCA since the founding of the association in 1983. In fact, EFIBCA developed the first internationally recognized quality standards for FIBC in 1985. These served as the foundation for the ISO 21898 standard which followed. Since then, further regulations have emerged for the transport of food, hygienic products and dangerous goods in FIBCs and minimizing the risk of electrostatic charge. However, conformance with quality standards is not a given in a price driven market. Practice shows that safety is still a concern — avoidable accidents with FIBC occur too often. A poorly constructed FIBC — or one not fit for intended use — can tear, puncture or burst, putting operators in considerable danger. Furthermore, human health and the environment can come to harm if inferior quality or not-fit-for-purpose FIBCs are used for dangerous goods. Similarly, quality and static protective standards must be upheld in potentially explosive environments and with powdery, dusty filling material. The consequences of accidents and incidents through non-conforming FIBCs can be great and the financial losses significant. Quality and safety are highly regulated areas and difficult to navigate for those not immersed in the subject. Many end-users of FIBCs lack this specialized knowledge. EFIBCA-Q aims to raise awareness amongst users of FIBCs about quality and safety standards relevant for different types of FIBCs. The initiative consists of a voluntary pledge by FIBC manufacturers and suppliers to conform with the EFIBCA-Q Quality Criteria, a list of specifications and requirements relevant for different types of FIBCs. Subscribers to EFIBCA-Q furthermore commit to provide their customers with detailed information on all quality requirements and to provide evidence of compliance on request. The EFIBCA-Q Quality Criteria as well as evidence can be requested from the FIBC supplier and are also made transparent to FIBC users through publication on EFIBCA’s homepage. Users of FIBCs are encouraged to engage with their FIBC supplier on the EFIBCA-Q Quality Criteria and to include these criteria in their supplier audits. Legal compliance and corporate social responsibility are also areas of concern for users and suppliers of FIBCs alike. Conformity with fundamental legal requirements in the fields of competition and antitrust law as well as internationally accepted ethical principles are a prerequisite for doing business with many companies. A Code of Conduct is an efficient means for users to determine which business partners are committed to basic ethical principles. In dialogue with its members, EFIBCA has developed a code of conduct for its member companies to uphold in their business dealings. The EFIBCA Code of Conduct is a voluntary agreement, through which EFIBCA member companies guarantee the observance of globally recognized principles of ethical behaviour as well as the standards of proper business conduct in the areas of competition and antitrust law. This also means promoting fair and sustainable standards dealing with suppliers, customers and with company personnel as well. Respect for human rights and protection of the environment are at the heart of Corporate Social Responsibility. Subscribers to the Code of Conduct also commit to take reasonable action to provide employee training with regard to the contents of the Code of Conduct, create accountability and internal procedures, where necessary, and aim for affiliates, subcontractors and other business partners to also accept the standards set in the Code of Conduct. In order to obtain a certification, subscribers must take part in a regular survey taken every two years. Business partners may sometimes expect other companies to accept their code of conduct when a contract is concluded. If a company agrees to this, the business partner’s code will form part of the civil law relationship between the parties.This may also involve consequences under liability law and should therefore be avoided. If both contracting parties have their own codes of conduct, the problem can be solved by way of mutual recognition. As a branch codex, the acceptance of the EFIBCA Code of Conduct on the market may be higher than of individual company codes. EFIBCA-Q and the EFIBCA Code of Conduct are voluntary company commitments. No audits are performed by EFIBCA to guarantee that these commitments are adhered to per se, however non-conformance can result in exclusion or annulment of certification respectively. Both initiatives are intended to increase consumer awareness and transparency. EFIBCA strongly encourages all FIBC users to engage with their suppliers on these issues and to integrate the relevant standards in their supplier audits (see figure 1). Take reasonable action to provide employee training with regard to the contents of the Code of Conduct, create accountability and internal procedures where necessary, and aim for affiliates, subcontractors and other business partners to also accept the standards set in the Code of Conduct. With a comprehensive stock of spare parts, HAVER’s South African subsidiary assures reliable service when it comes to maintenance and service. Fulfilling customer requirements dependably and rapidly: that’s the target which HAVER & BOECKER has made its top priority.Working out of Johannesburg HAVER Southern Africa has been active on the African market for the company group already since 2008 and is always in close proximity to customers. Since the company has moved into its new offices in the South African metropolis last year, the HAVER subsidiary not only has offices and meeting rooms which are outfitted with the latest equipment, it also has a comprehensive stock that ensures customers get reliable and quick support when it comes to maintenance and service. Last year was marked by rapid development.The number of employees more than doubled.Additional service technicians and sales staff have rounded out the team. “Foremost it was the takeover of the packing technology in 2012 that brought us to a whole new level,” said managing director Joachim Hoppe. Previously HAVER Southern Africa had provided products and services from the Mineral Processing and Wire Weaving Divisions. Now the subsidiary company has the full product portfolio of the entire HAVER & BOECKER Group in its product range. HAVER & BOECKER is a traditional family-managed, mid-size company with headquarters in Oelde,Westphalia, Germany. Under the umbrella of HAVER & BOECKER OHG, one finds the Wire Weaving and Machinery Divisions. Together with over 50 subsidiary companies on all five continents, they make up the HAVER Group which has 2,870 employees and 150 representatives. In 2013 the HAVER Group posted a sales turnover of €470 million. The Wire Weaving Division produces woven wire mesh and processes it into engineered woven wire products.They are used for screening and filtration by the chemical, plastics, automotive, aviation, aerospace, electronics, foodstuffs and feed industries, as well as for architectural applications and analysis sieves.